Text messaging has become an essential part of the daily operations and communications of many companies. Still, many organizations are still unaware of the need of archiving their corporate mobile messages and having a text message archiving strategy in place. Many entrepreneurs and professionals from various sectors are still unaware of the importance of mobile text message archiving and the bad things that can happen when they have no archiving system in place. As smartphones, chat apps, and texting becomes an integral part of today’s workforce, it is of extreme importance that a business can trace all text-based communication taking place within its premises. 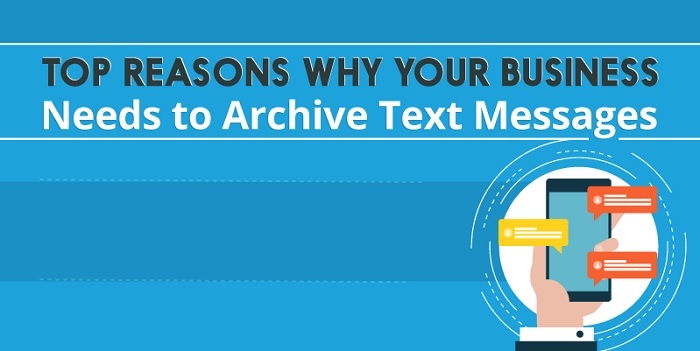 To better understand this topic; here are the key takeaways from the Infographic below developed by team “TeleMessage” which discuss the most compelling reasons of why text message archiving should be a priority of your business. Many sectors, such as the finance and healthcare, have rules and regulations concerning the need for organizations to retain and produce correspondences containing sensitive information. Such documents include financial statements, emails, employee records, and communications with clients including text messages and chats. Whether as a plaintiff, as a defendant, or as an interested third-party, your company can rely on archived information such as text messages, in case you need to pursue a legal action or defend yourself in one. The requirements of Federal Rules of Civil Procedure also state that an organization has the obligation to search and produce electronic content, including text messages. When your company has diligently kept all work-related text messages by your employees, will be able to place a hold on data immediately when requested by court, regulator or on the advice of legal counsel. It will also allow you to suspend deletion policies and practices, and retain the data for as long as needed. Text message archiving allows employees business to access messages containing work-related information without the need to access them on a live server or store them in the device’s storage. Ultimately, it results in higher productivity of both of your employees and IT personnel, and more efficient backup and restoration process. Having a mobile text archiving system in your business gives you the ability to retain the relevant information needed to build your organization’s history. As technology changes, ensuring that your communication data will remain secure and retrievable years from now is critically important.